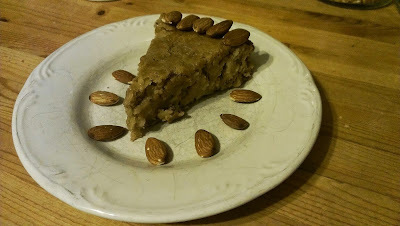 This is The Haggis and Herrings first food post since the passing of my brother Daniel who quite proudly ran this blog. Meredith and I really never knew when we would post again about food... until now. So here I am, mainly on behalf of Meredith the baker and me (Abisaac) the taster. So why now? Before Daniel passed away he pre ordered for Meredith's birthday the recipe book "Saved by Cake, over 80 ways to bake yourself happy" by Marian Keyes. The book arrived after Daniel passed away, but before her birthday. At the time, he ordered it knowing how much Meredith loves to bake. After all Meredith's finger prints are all over this blog when it comes to baking. Looking back the title of the recipe book was fitting to the situation that unfolded. I'm not sure if Meredith looked at the book much before this weekend or not because I didn't ask, but when I tasted the cake and she told me why she baked this particular cake, I knew this was something to post. I said "Tahini in a cake? Seriously? " She explained "This would have been the first cake Dan would have made me make and he would have said exactly that!". So she made it and shared it with others. Without knowing what was in the cake, I really wouldn't have known tahini was in it. I got the pear right away, although I thought it was apple (I guess I don't have the most refined palette). The cake reminded me of a crumble cake because it was very moist inside. I hope we can do more of this within time! It certainly felt good to blog here! Check out the recipe below. Give the tahini a quick stir while it's still in the jar. This is because tahini usually separates itself when standing. Pour into a mixing bowl and beat with syrup. Add the baking soda and mix again. In a separate bowl, combine the sieved flour, cinnamon, almonds and diced pears. Add a third of the flour nut mix to the tahini and mix. Add half the pear juice and mix. Add another third of the flour and the other half of the juice. Finish with the remaining flour and mix until combined. Pour the batter into the tin and bake for 45 minutes. After 30 minutes drop the over temp to 325F and cover the cake loosely with tinfoil for the final 10 minutes. Remove from oven and let cool. The recipe book doesn't recommend any toppings, but we decorated it with some extra almonds. Baking is therapeutic. I am sure this recipe brought smiles and good memories. I was thrilled to see this post. Baking is therapy and what delicious therapy this cake is. Hope you post again soon. Thank you everyone, it brought smiles to many people, not only the cake but being able to post about food again.